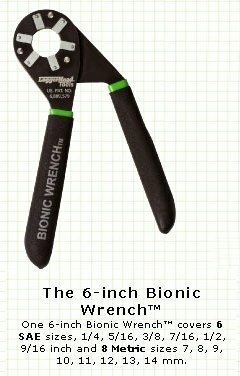 Buy both 6" and 8" bionic wrenches and SAVE a total of $5. The 6" and 8" will cover 30 DIFFERENT FASTENER SIZES! These 100% USA made high quality wrenches fit a wide range of of fasteners, nuts and bolts. The grip and leverage is phenomenal--with 6 sides of the wrench applying pressure..even the most stubborn nuts/ bolts can be loosened...with a minimum amount of effort. FANTASTIC GIFT ITEM FOR ANYONE!!! 6 SAE sizes: 1/4, 5/16, 3/8, 7/16, 1/2, 9/16 inch, and 8 Metric sizes, 7, 8, 9, 10, 11, 12, 13, 14mm. The 8" Bionic Wrench covers the following sizes:6 SAE sizes: 7/16, 1/2, 9/16, 5/8, 11/16, 3/4 inch, and 10 Metric sizes, 11, 12, 13, 14, 15, 16, 17, 18, 19, 20mm. Yes, you guessed it---you will probably need both the 6" and 8" bionic wrenches to cover nearly every size fastener in your garage or workshop. These 2 wrenches will cover different size fasteners! That's why we offer a package deal! Buy both 6" and 8" bionic wrenches and SAVE $5 on the total price! The $5 discount will be be applied automatically at checkout.